First of all, most bathroom drain clogs result when dirt, skin flakes, and especially hair binds to soap scum on the walls of drain pipes. So, over time, this gunk accumulates and reduces water flow. Hence, kitchen sink drains clog when cooking grease or oil cake onto drain pipe walls. So, add detergent soap scum and undissolved food particles, and you’ve got a stubborn, gunky clog. Even more, if you are constantly plagued with clogged or slow drains, have a plumber inspect the plumbing to determine if the drain line was properly designed and installed. Both drain pipe venting and slope effect how well drains work. Furthermore, here at Apex Plumbing Solutions, we are always happy to assist our clients, both residential and commercial, with clearing their blocked drains. In addition, we are highly skilled at what we do and have the experience to handle just about any problem you can throw at us. If you need a blocked drain service in your area then please call Apex Plumbing or book online for a quality blocked drain service guaranteed. You never know when an emergency may arise, we’re available 24/7 to provide you blocked drain service. First of call, we will check for many things such as odours, gurgling sounds, blocked flow etc. Hence, it will enable us to determine the best method of approach to unblock your drain fast. So , from here we will also explain what will happen if you delay the blocked drain, and the benefits of unblocked drains which is the obvious and transparent. Finally, we will maintain a clean, fast and efficient method without disrupting your day while doing the service. Blocked Drain Service is a process of removing build-up debris or materials that causes a barrier to the flow of water. So, blocked drains for properties can be a nuisance, but if caught and dealt with early on they are relatively easy to fix and you might be able to avoid more serious leaks. If you require guaranteed Blocked Drain Services in properties, customers can always rely on the great work of Apex Plumbing Solutions. We’re available 24/7 to provide you blocked drain service for your properties properties. Water Jetter – Our blocked drain plumber experts use a High-pressure pump down the blocked drains and it helps clear the blocks in the drain to unblock your drain fast. CCTV Drain Camera – Our blocked drain plumber experts use the latest in CCTV drain cameras which allows our blocked drain plumbers to monitor above the ground and see what is causing the block. No Dig Pipe Relining – If there is any damage to the sewer pipe, may recommend the use of the specialized no-dig pipe relining method. Pipe re-lining is a PVC material that is inserted into the damaged pipe and give you a fixed permanent drain, digging and disruption on your property. Slow drainage, foul odours, and obvious sewage over spill are indicators of a blocked drain or sewage. If there’s a blocked drains, then issue can get worse, which could result in dig up work and more costs etc. Drain cleaning service is a process of removing soft or hard obstructions along the entire length of the drain, from the drain opening through the main sewer drain to the lateral piping outside the building. Blocked drain service is one way of drain cleaning service. 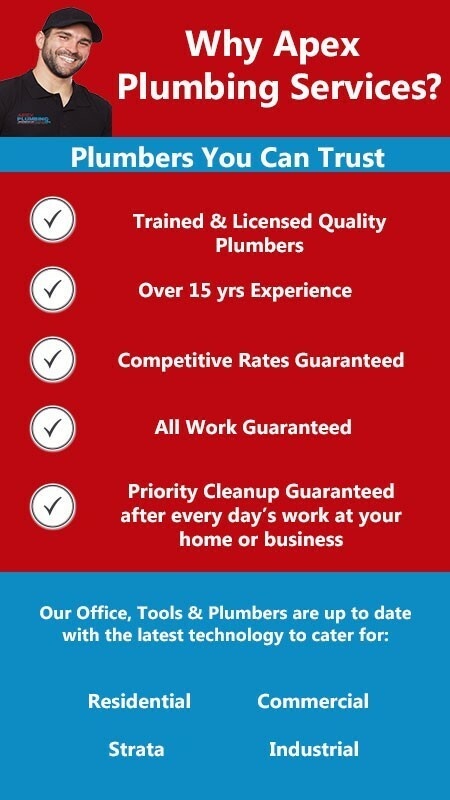 Apex Plumbing Solutions commits to provide an exceptional blocked drain service and promise a quick response time within our main service area for all drain cleaning work. There are many ways to solve these blocked sewer problems and will depend on the situation with your blocked sewer such as location, access and how badly your drain is blocked. No need to worry, we clear your drains properly! Blocked bathroom drains consist of the drains in the common are, bathroom tub, bathroom shower, vanity etc. Our bathroom blocked drain plumber experts are ready on cal to fix these issues and give you a better flow of water at your property. You know your due for a professional toilet unblock service, when you realise that your toilet is not flushing and have issues with the water bowl. These common occurrences are from excessive use of toilet paper, or flushing down other material in to the toilet either purposely or accidentally such as pads, thick tissues, objects etc. We have great techniques to fix these issues, so contact us for a toilet plumber expert to fix the blocked toilet issue fast. Most common reasons for a blocked kitchen drains is food scraps or grease. Our blocked drain plumber experts plumbers have the best methods to unblocking kitchen sinks. Finally, some of the best tips for clearing a blocked drain. So, will adopt the following methodology: plunger, acid, plumbers eel, or a high pressure water jetter.